i made this a few months back (and have made it several times since) and completely forgot to share it with y’all! a good friend reminded me of it yesterday and it just may be going in the crockpot this week. now, if you know me, you know that in my past i have not been an avid crockpot user. just never really got into it. but in october, i dusted the thing off (seriously, it had been used twice since we got married in 2003, i think) and i am IN. the cold weather just made it sound so lovely… a warm meal cooking all day and making my house smell like i RULE???!! yes please. combine the chicken broth, beans, corn, rotel, cilantro, scallions, garlic powder, onion powder, cumin, cayenne (if using) and salt & pepper (to taste – i used 3-4 grinds on my s&p mill) in the crockpot. season chicken breasts with salt and lay on top. cook on low for 10 hours or on high for 6 hours. half an hour before serving, remove the chicken and shred with 2 forks. 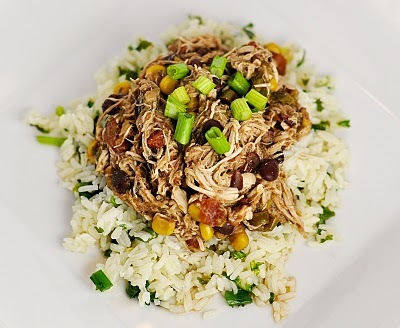 return chicken to crockpot and stir in. serve in tortillas or over rice (idea: make white rice and chop up some more cilantro and mix together). top with cheese, sour cream and/or salsa.